We all have the ability to do more than one thing at a time...I mean come on we are parents for heaven's sake. Who hasn't juggled a child in the bathtub and a phone in our ear or cooking dinner for the family and paying bills on the computer. But do you really know how to manage your time? The definition of time management is the act or process of planning and exercising conscious control over the amount of time spent on specific activities, especially to increase productivity or efficiency. I found a few tricks to help me with managing my time and not feel so overwhelmed trying to be wonder woman and accomplish everything every day. 5 Time Management Tips that works for me. 1. Make a list - Mark off a couple of items each day. Don't try and do everything on the list the first day of the week. Be practical. 2. Learn to say NO! - When someone asks you to volunteer or do something you don't want to do, say no, politely, but firmly. Don't feel guilty either. Focus on those things that are important to you, family, friends and health. Once you are comfortable with what you have time to do, turning down things that don't fit into your priorities is easier. 3. 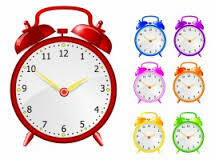 Use a timer - Set a kitchen timer or the timer on your phone for 10 to 15 minutes. Start cleaning/organizing the area in your house you want, you will be amazed how much you can accomplish in that amount of time when you focus your attention on one thing at a time. Just picking up for 5 minutes before you head out the door in the morning is also helpful. 4. Non-negotiable time for yourself - Plan time for yourself every day, whether to sit and meditate or just to have a cup of coffee. We change our plans to suit someone else's needs but rarely do we put our own needs first. Try doing this for yourself...This is one appointment that is key to your growth in all areas of your life, work, family life, socially. 5. Identify your time wasters - Anything that distracts you from the most important thing you need to be doing. Do you waste time reading, social media, talking on the phone or watching t.v.? My big time waster is social media. I would rather do this instead of housework, walk the dog or anything I should be doing. I need to unplug more often. How about you? I hope my writings bring you information that is useful in your life. Don't die with your DREAMS still inside you. Vision Boards have been utilized by many successful people for years because they are cheap, UBER fun to create and effective. Sound awe-inspiring? What is a Vision Board you ask? A Vision Board is a collage of images, pictures (can be personal pictures) and affirmations of your dreams, goals and all the things that make you happy. Vision Boards are a great way to make you feel positive about yourself, life, family and your future. A vision board acts as a constant reminder to ourselves that our wants in life is BIG IMPORTANT BUSINESS! One reason our boards need updated from time to time. The beginning of the year or birthdays are good time to make that happen ~ so that the new visual imagery sparks new paths and interest in our eyes/brain and that its new and interesting information that we need to remember. If you haven't already ~ set some goals! Goals are needed to manifest and make into a reality! Set your intentions, make up your mind to THRIVE instead of just SURVIVE and your half way there. 1. Creating one is a blast! This is a chance to reconnect with your inner child. Think of it as the grown up version of picking your toys out for Christmas or your birthday. Instead of toys its dream homes, new careers, retirement retreats, etc. Make it a party and have friends gather with food and drinks for a social activity. Locating the vision board somewhere it can be seen often, provides you with a reminder daily of your goals and what you are working towards often. It's a handy tool to have when you have a challenge or obstacle along the way. Pushing forward is easier when you have a visual reminder. Visualization doesn't come easy to all of us. While we all can list off the things we don't want for our lives, getting specific about the things we do want can sometimes be a challenge. For those of us holding a mental picture of what we want for 5 minutes a day seems impossible! Vision Boards provide you with physical pictures that you can focus onto help you make your goals come true! Getting creative for some people is very scary. Fear of what if, vulnerability can be too much for some people to handle. Especially if someone would happen to see these goals and dreams. Creating a vision board is an exercise in thinking beyond what you believe is possible for you right now. This activity allows you to open yourself up to opportunities and dreams and watch them actually happen! Put it to the test for yourself. Seeing is believing. If you would like to experience these benefits of having your own vision board, join me and sign up for the upcoming events tab!!! I read this today and had to share, what great words to remember and recite daily. In case you haven't heard this today! Wow, what a year this has been for me! I conquered some fears, left behind a relationship of 6 years, even created a few goals for myself that mean something to my spirit. I started the year with studying for my certification in Life Coaching. How exciting that was for me. Every Tuesday night was devoted to class, listening and studying, something I haven't done for quite a few years! In May, I traveled to the great Sunshine state for a vacation with 3 of my girlfriends. Lots of laughter, a few tears, but always great conversation every morning over coffee. We had some real heart to heart discussion about family, faith, divorce and raising children. Wow we all learned so much about ourselves and each other. Everyone should take a vacation with their girlfriends just one time! August was a month of super excitement for me becoming a Certified Life Coach. I was so pumped and proud of myself for sticking with it for 6 months and missed 1 class in process. Pure joy! In September we welcomed a new addition to our already large family, Owen Ross. 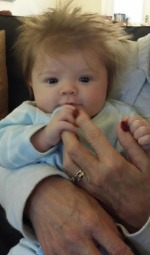 Nothing but pure sweetness, cuteness and that hair...just can't get enough of him. He is a great nephew to me and he is the son of my Godson Sean Ross. Holidays and birthdays were exciting and fun, as usual, with my family this year. It was a time to visit with members I don't ordinarily get the chance to sit and talk and catch up with. My daughter Hannah (my sunshine) has a late December birthday which gives us another reason to get together and celebrate. Well, that is a wrap on 2014! Stay tuned and look out 2015! I hope my writings excite you today and every day of your life. It has been said that going through a divorce is one of the most stressful transitions a person will go through in their lifetime… Crippled with stress, sleepless nights, financial concerns, and loneliness are just to name a few of the life transitions with a divorce. With one out of two marriages ending in divorce, the painful process can be one heck of a journey that is unforgettable. When do you get passed the pain you ask, only if I had a crystal and was a fortune teller could I answer that question? For some it takes months, others years, and for some people they never get over it. I can only speak for myself and from my experience with divorce…it was stressful, I was ate up with concern for my kids that were a junior in high school and junior at an out of state college. All I could hope for was that at some point my kids understand and learn from this life changing event. That was 9 years ago and I am such a different person because of that life transition. I found my strength, my independence, and my inner love for a person I have lived with all my life… ME. What a breath of fresh air to really know and love the person you are looking back at in the mirror. Who do you want to be after your life’s transition? Are you ready for some changes to happen?